I am disappointed with the seams of this frame. They don't meet evenly, resulting in bare wood showing. Adrian, thank you for your review. The bare wood should not be showing in the corners, and we are happy to correct that for you. We are pleased to offer a replacement at no charge. At your convenience, please send us a photograph of this frame as well. 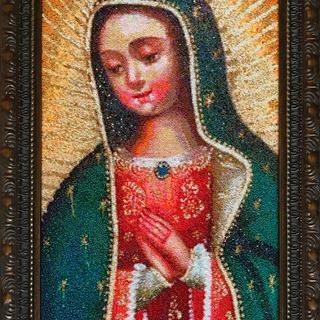 Please email the photograph of the frames corners to: customercare@pictureframes.com. Attention Shea J. Thank you again for your review. First frame arrived broken. Replacement was shipped immediately and arrived in excellent condition. My daughter framed a tapestry and it accents it beautifully. Sets off a family heirloom beautifully!! 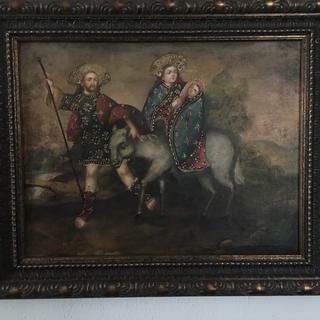 I was concerned about framing this Victorian watercolour that has been in my husband's family for more than a century. I kept the original gold leaf mat that was used in the framing in 1867. The frame itself was in dire need. 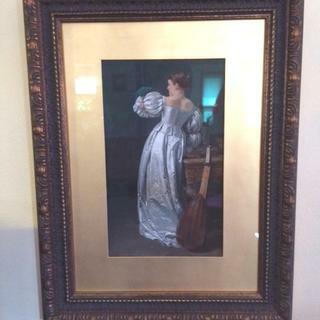 The frame was the perfect vehicle to display this Victorian lady by Edward Killingworth Johnson. Thank you so much. We appreciate you taking time to share your family's precious artwork. Thank you for your business! I bought this to frame a canvas printed portrait of Admiral Horatio Nelson. It was perfect! I would highly recommend this style for anyone looking to frame a portrait painting, especially 18th or 19th Century. The frame is beautiful , my artwork looks worderful and quality is great. 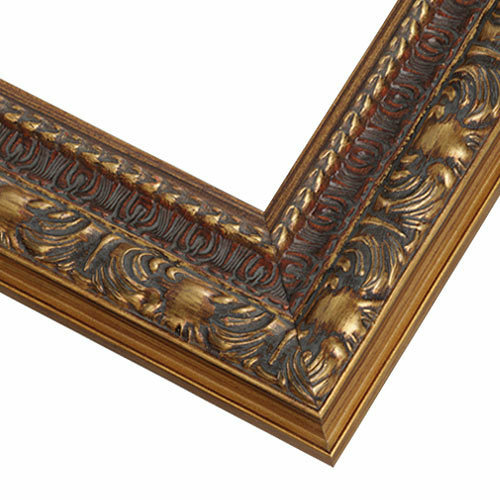 Quality traditional gilded wood frame. This frame is gorgeous and great quality. 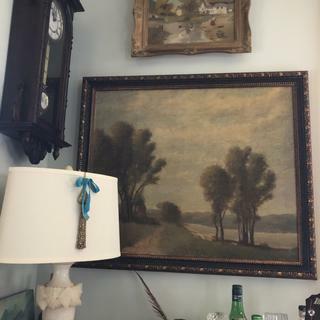 I had a large antique oil painting on board, which I didn’t want to overpower with a extra wide frame. This one looks amazing and I’m very happy with my purchase. I'm always pleased with the quality and value of the frames I order from pictureframes.com. The service is top drawer. I get my frames within a few days of ordering them as though I'm a VIP! Really Beautiful frame! A little darker than in a catalog, but looks even better! Thank You so much pictureframes!!! Beautiful frame. High quality. Great customer service. I am very happy with this purchase. The only place to buy frames. Always top quality at extremely reasonable prices accompanied by quick delivery. I would purchase again. I was very happy with all aspects of my order. I absolutely love the look of the frame. If you are installing it with borders, make sure to use a small piece of clear tape on the back of the photo, when laid in, to the back of the border as I did, or it may fall in since there is only a tiny amount of overlap. Great Frame! It's not as dark as in this picture. Excellent! Would definitely buy again! I measured my artwork exactly and the frame fit perfectly! Very easy to install the hanging components and it looks incredible. Nice frame. It fit the picture perfect. Darker than we expected but we liked it even better. I had to call with a question prior to placing an order. They were helpful and answered all questions. I was very happy when the frame arrived. Excellent quality and beautiful! YOUR FRAMES MAKE ALL ART, MASTER PIECES! The Quality can not be BEAT! EXCELLENT PRODUCT, every time I order. The frame is very well made and the lithograph was easy to put into it. The clear acrylic UV protects it from fading in the sun, but is lightweight. I've purchased several frames from these people and have never been disappointed. I wanted an open back frame similar to a frame in my painting. This frame was perfect. My first time ordering and I was afraid the frame would come damaged but it was packed very carefully. So glad I received samples, the original frame I was going to order would have been too bulky. My 63" x 15" frame came well protected and is just perfect! Bought this as a gift. Love it! Beautiful and exactly as it looks. I am very happy with this frame. The color is nuanced and very attractive. Joinery is good not great. That is more a nit pick though. A person viewing the frame probably wouldn't notice. It is about what is inside the frame after all. Delivery on a custom order was very fast. The packaging was super secure and well thought out. All in all, I recommend this frame and this company without hesitation. I am very satisfied, and will do business with them again. Color and molding design will compliment my wood burning piece to make a statement. It will enhance a portrait very well. 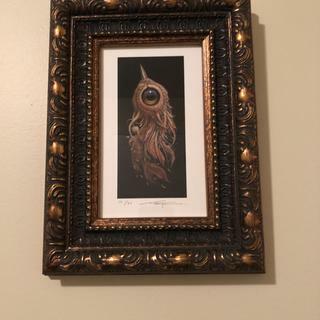 Needed a frame with gold and red and this was the prettiest choice. I believe it will compliment the portrait I am framing, and there were good reviews. love the frame, second time ordering it. The print has a large black sky and strong reds. There is a muscular subject. The texture balances the muscles, the red complements the red of the picture and the complexity of the design balances out the plain black sky. See Frazetta cover on Time War book by Lin Carter. I have a print on canvas from the Frazetta museum. After looking at a couple of samples I had received, this one was ornate without being overwhelming (my frame size ordered is 63" x 15"). The gold, cherry, and gray/blue added a nice variety of color to complement the print I was planning on putting on display. Traditional frame with bright accents to offset the dark tones of my classically painted piece. They are for a painting contest. 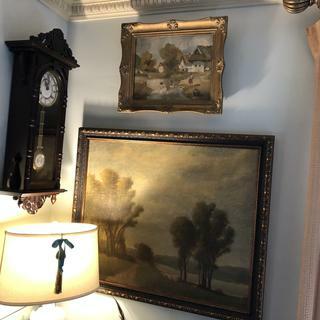 The pastels that I painted are pastoral, and I liked the carved darker gold frames. I felt that they would compliment the them. 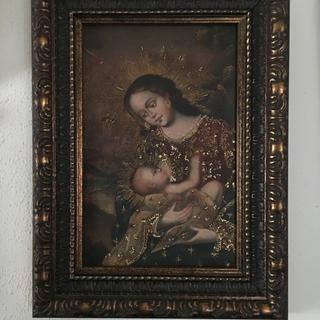 I have a family heirloom painting of my mother and this frame matched the original frame (which had been damaged) almost exactly. Fit very nicely with the antique print I am framing. I recently did a painting of the Tuscan countryside and a farmhouse. I'm anxious to see how well it is going to enhance my painting. I've also purchased this frame previously for 2 larger paintings I'd done and it's a very beautiful frame. 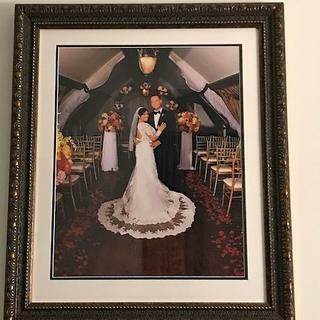 I chose this frame for the color scheme and its rustic elegance. The painting it will be framing is a circa 1922 oil landscape of the Rocky Mountains. The colors work well with my art print; deep reds and some gold but not too bright. I purchased this frame last year and I like its look and quality. It looks better than on the website and the magazine photos. I like the reddish (cherry) tint. It complements my paintings well. I felt it would enhance the art as well as fit in the hanging spot available. This color and style complements a painting. I wanted an ornate picture frame for large pictures for the bedroom. It goes with a painting I have just finished. This frame will be the perfect compliment to a watercolor heirloom. If my painting is 9.8 x 11.8 do you suggest going up to 10x12? BEST ANSWER: I bought this frame twice and bought to exact size. If you can save money by getting it larger you can but would have to and use some padding so it isn’t lose. Also depending how thick your painting is, i prefer the brackets that you use on the floater frames to hold it in rather that the clip-on. The clip on fall off but the others screw in painting and it would solve the problem of buying frame larger. Frames are pretty true to size. I don't think that you can go smaller, but you can go with 9 7/8 x 11 7/8. The rabbet on this frame is just shy of 1/2", so I know that you'd have enough wiggle room with that size frame without running the risk of your painting 'floating' in it. If the rabbet is in fact 7/16" (cannot remember) and we are talking 9.8 (9.75") x11.8 (11.75") in inches, you can shim/glue/tape the picture into place with something less than 1/4" (.23") to hold the light picture. I think that would probably be best. If you use a point setting tool to secure the painting in the frame, you should be able to position the panel exactly where you like and not get any slippage. Hi Jennifer. We build our frames to the nearest 1/8", therefore, we suggest to round your measurements to the nearest 1/8". This will ensure the best fit. Thank you! Jennifer, I haven’t seen your painting but if you go with the 10x12 I believe you will definitely need a two (2) inch mat all the way around. I can say, this is a beautiful frame, and with, or without, the mat, you will have an awesome piece of art to hang! Can you paint frame to make it more gold? BEST ANSWER: Hello! We do not suggest painting this moulding, but perhaps consider one of our unfinished wood frames. Please see the frame below. Thanks!